Not long ago I had the pleasure of witnessing one of those not infrequent moments around here, when patients get together with caregivers to say thank you. Patients and their families find different ways of doing this, from cards and letters to homemade gifts as well as hugs and shout outs on social media. And on the receiving end, the physicians and nurses and technicians certainly appreciate it. This situation was slightly different. The physician in charge of the woman’s case held the celebration, a very nice dinner, but of the majority of people that Stacy Erholtz thanked that evening, only a handful were physicians. In fact, most of the audience was not from the clinical areas. They were laboratory scientists. And yes, they are caregivers, too. 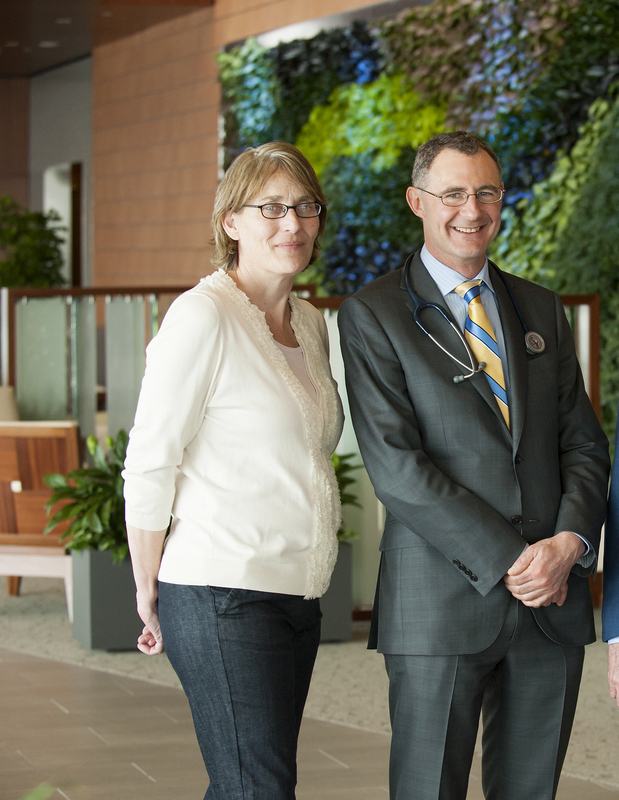 Some had met her before, when she was declared free from cancer for six months, when Dr. Stephen Russell brought her to his lab to introduce “the Team” to “Patient 11.2” as she calls herself. That was her designation in the clinical trial of the measles oncolytic virus as a treatment for multiple myeloma. Now cancer free for over a year, she stood at the podium and thanked the people who had pinpointed mutations, conducted genetic analyses, as well as animal studies on her tumor, and had started the basic measles virus experiments over 15 years ago in Europe. And then there was the team that is continuing to grow the virus in labs here at Mayo so another phase of clinical trials can begin next month. Stacy Erholtz with her physician, Stephen Russell, M.D., Ph.D. Here were scientists with their spouses, enjoying a social occasion with someone whose life they helped extend. A researcher once told me that a biomedical researcher is someone who continues to forge on, for years if necessary, amassing knowledge about the cause of a disease, with the real possibility there won’t be a breakthrough. The clichéd eureka moment may not happen until after a researcher leaves the scene and a successor builds on that foundation to make the critical discovery. It takes dedication, vision and commitment since we’re talking about a decade or two of someone’s professional life. Stacy Erholtz understood all of that when she said thank you and you could feel it across the room. Listen to Dr. Stephen Russell talk about the measles virus therapy with Ira Flatow on NPR’s Science Friday.